I have a Margaret Howell-Porter collaboration bag that I like to use for when I am out. If I am just going 15-20 minutes from my house I may choose a smaller bag or no bag at all, but otherwise this is my go-to bag. It is not a camera bag by any means, but its boxy shape and size allows me to keep enough things inside while keeping the overall size and weight down. I could conceivably fit a Leica and maybe two spare lenses and some film in this bag. 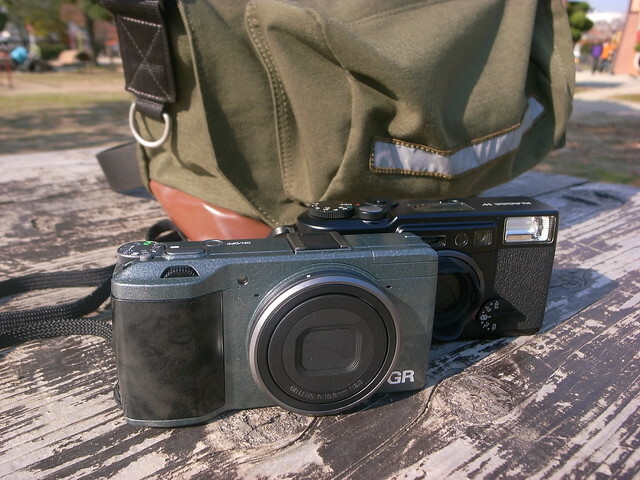 These days I mostly carry two compact cameras. The day I took this photo I had my GR Limited Edition, Fujifilm Klasse W, and my old Ricoh GRD2 (with which I took the picture).